I’d spent the night tossing and turning with a mind full of worry. Sound familiar? Throw in the challenge of a suffocating 90 degree heat wherein the only breeze created was from all that tossing and turning, and try as I might, I couldn’t even will myself to sleep. I read. I watched mindless TV. Sheep? All counted. Warm milk? Eeww! Sleep aids? I don’t think so. Nothing would help on this hopeless night. So early the next morning I decided to get away from it all and take my troubles to the sea. Only a few quiet souls dotted the deserted beach when I arrived, so I was able to get up close and personal to the line where the sand meets the surf. The chilly ocean breeze was just what I needed to extinguish the overpowering heat permeating from my skin. I closed my eyes and enjoyed the warmth of the sun on my face. I squinted upward at the brilliant sunlight and gorgeous blue sky, deplete of any trace of a cloud. I took a deep breath of the salty sea air and exhaled slowly. In and out. In and out. My body relaxed. I watched the glimmering jewels of sunlight dance across the water’s surface like a brilliant bedazzled showcase. The waves flowed evenly in perfect unison – back and forth and back and forth. I heard the moan of a foghorn from a ship in the distance. I took another deep breath and realized that life was basically good. I thought about the things causing my restlessness – all legitimate reasons to feel unsettled. 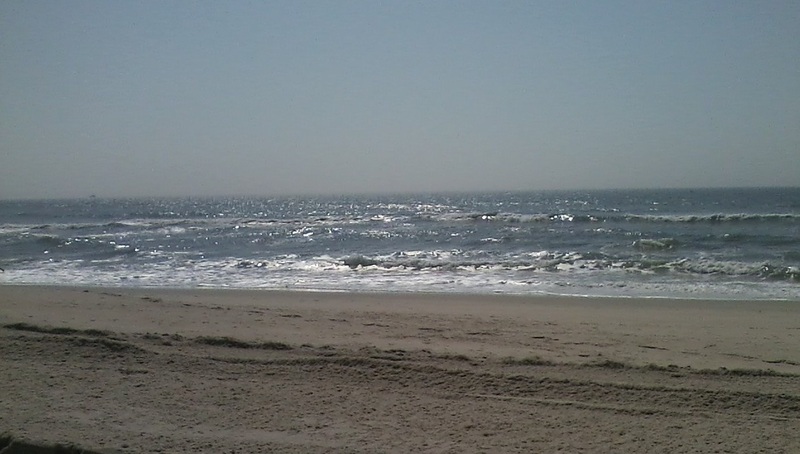 And yet, looking over the vastness of the ocean, my problems seemed minuscule. I pictured the underworld life existing just beneath the surface of the vast blue /green water. I could picture the perfect harmony of the creatures in the sea and wondered how all the different species could have survived through the turmoil of thousands of years of rocky waters, and yet they do. I would, too. Finally able to relax, I read my book, I snacked and I snoozed and felt a whole lot better. That is until the beach was deluged by throngs of noisy, rambunctious, screaming teenagers whom I imagined were celebrating senior cut day. Luckily I had already gotten my mojo back because it was definitely time to go. The best prescription for a sleepless night: Take your troubles to the sea…early in the day…before the throngs arrive…and don’t forget to wear sunscreen.